Neptune is the god of horses, water and the sea in Roman myhthology, brother of Jupiter and Pluto. 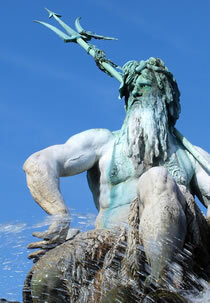 Neptune is the Roman name for the Greek god, Poseidon, lord of the sea. Poseidon was one of the children swallowed by Cronus (Saturn), who was freed by Zeus, his brother. He was so thankful that he joined Zeus in the battle against his father. 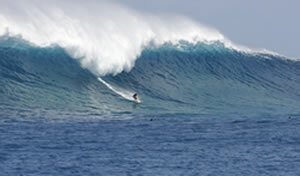 Poseidon commanded the Storm wind and the surges of the sea. The Cyclops, monstrous children of Mother Earth, made Poseidon a mighty trident that shook the earth and created mountainous frothing waves wherever it struck. Zeus, of course, won the battle and overthrew his father. In return for his support, Zeus placed the throne of Poseidon next to his own on Mount Olympus. Poseidon also had a splendid palace beneath the sea, and whenever he drove his golden car over the water, the waves became still and tranquil. He was known to be a kindhearted god, saviour of sailors and damsels in distress. Lots of damsels. Almost as many as Zeus, but not quite. 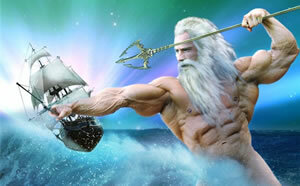 In keeping with his honorable nature, Poseidon demanded loyalty and respect from others. Woe be to those who disregarded these rules. He could wreak havoc all around them, flying into a rage and using his powerful trident to stir up hurricanes and earthquakes. Neptune, ruler of dreams and spirits. Neptune, ruler of sound, ruler of music, languge of the gods. Neptune, ruler of idealization and perfection. Neptune, ruler of deception. We get sucked into the world of fantasy so easily. Nothing there is difficult. Nothing there requires any effort. At least, so it seems. Then one day we find ourselves stuck in some world-class mire because we forgot to take off our rose-colored glasses long enough to check out reality. When Neptune connects to planets in your chart, it's function is to dissolve the brittle and hardened features that it finds there. 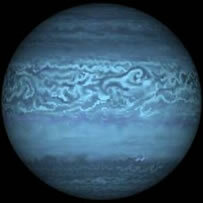 Neptune's role in bringing the intangible aspects of life into our awareness is the reason that Neptune is classified as one of the Transpersonal Planets. Neptune is the second farthest planet from the Sun and takes nearly 169 years to complete one orbit around the it. It was discovered in 1846 and completed its first full trip around the Sun since its discovery in the year 2010. For the twenty years from 1979 to 1999, Neptune's orbit has taken it outside of Pluto's, temporarily making it the farthest planet from the Sun. Neptune turns retrograde once each year. 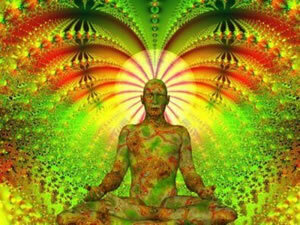 The retrograde period lasts for about five months each year. It usually turns retrograde fourteen times in each sign.